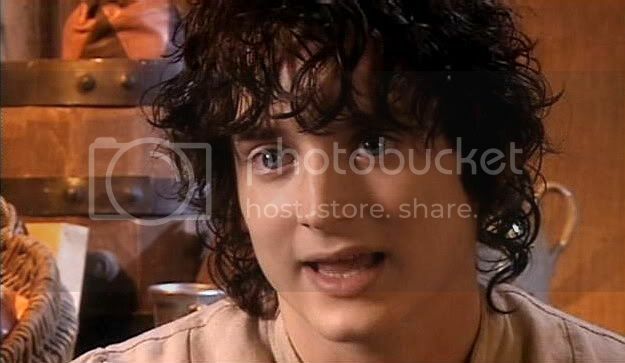 TTT Extras 3: Interview with EW, in Frodo costume and make-up. I am giving the thirteen caps below their own post because I think they are so striking. 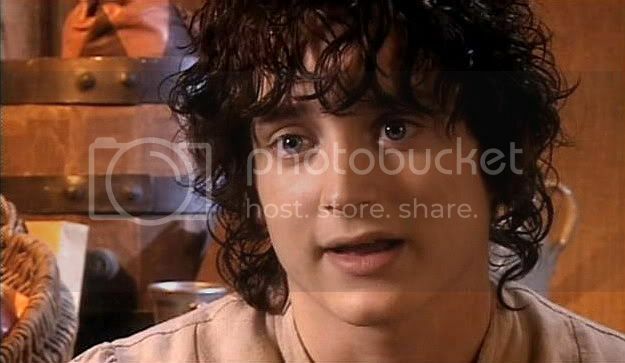 Back in the last Frodo Art Travesty entry we talked about how fans and reviewers, seeing film-Frodo on the screen for the first time, felt as if a living, breathing angel had stepped out of a Caravaggio. 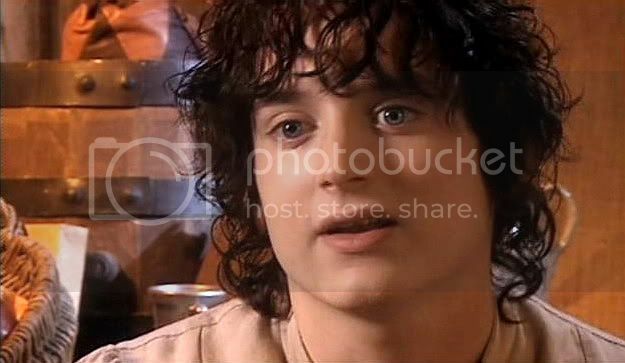 In the sequence screencapped below, Elijah Wood is speaking as himself, but, in that hair and make-up, his resemblance to a peaches-and-cream, tousle-haired Baroque angel (or Cupid—he only wants a bow and arrow) really is uncanny. Goodness, these really are breathtaking. I'm so pleased you liked them, Telstar! I assumed they must not have struck the fancy of *every* fan, or the caps would have been more represented at EW/Frodo galleries. I think they're super, but I'm a big art fan. ohhhh! I've never seen these before! He is so, so beautiful! Thank you for sharing them! You are welcome, The Art of Fic! They are lovely, aren't they? He is so Beautiful! And there have been so many caps over the years [omg - did I say years?! ], that I think people forget about all the wonderful bits from all the extras. These make me want to get out just the extra discs this weekend and savor them again. Is the weather going to be dull this weekend? If so, you could make a date with the extras. They really are so good, in spite of repetition from one extra to the other. Even when they include the same footage they often include slightly different versions of it. #4 ought to be illegal. He's his most Eros-like in that one, as if ready to loose his arrow on his next, hapless victim. I don't remember this bit from the extras! :o I'm going to have to look for it, later. Thank you for these, Mechtild - they're gorgeous. I could just frame #4 and hang it on the wall. Ha! Aliensouldream just singled out #4, too. I think he looks very naughty in it, in a Cupid-ish way. I let it be the "teaser" for this sequence. I don't remember having seen this series before, either. That's what made me think I'd never watched the extras that came with the TE of TTT before. What a little treasure! So pretty, so edible. And in context with these pictures, you can see that while still looking young, Elijah looks a lot older today. Yes, his face has really changed, Alyon. He could never again play the cherub-hobbit he was then. Bearing that in mind, I wonder how he could possibly play an even younger Frodo in the second "Hobbit" film, as has been noised about? CGI? Thank you so much for capping these. Isn't that face unbelievable? Angel, cupid, hobbit; all of the above. Those are such beautiful shots!!! *falls in love for the 1,354th time* ;) Thank you!! Aren't they beyond the beyond? Seeing this little sequence confirmed me in the opinion that I had never watched the Extras included with TTT TE. Some of the extras on it are included elsewhere, but I am sure I'd never seen this sequence before. Wow, I don't think I have ever seen this interview! What DVD is it from? Hi, BJTP. It said at the top, but not clearly enough. 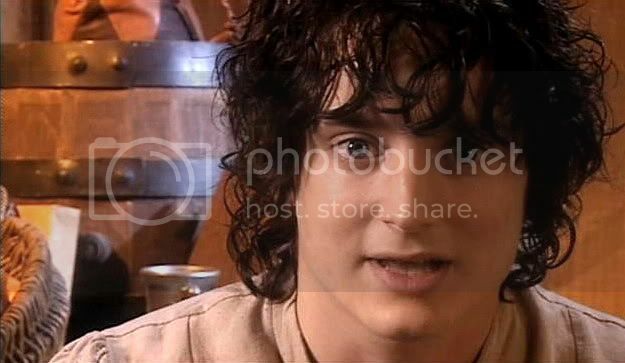 It's from the Two Towers extras, from the theatrical version. 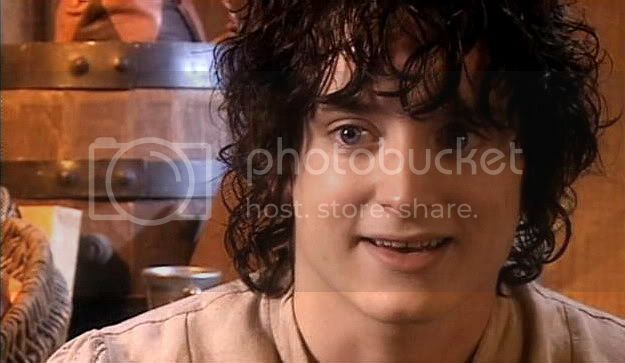 The name of the documentary this clip appeared in is "Return to Middle-earth: WB Special". So this is going to seem really odd coming from a COMPLETE and total stranger - especially with how old this post is, the fact it's probably not relevant to you anymore, etc, etc but I had somewhat of a request and thought, if anyone, you would probably know. I found your LJ by chance whilst doing numerous Google searches for a certain image - or rather an upgrade to an image I already possess. I'm looking to come by the knowledge of what section it is in in the EE LOTR dvds so I may cap it myself or perhaps a better version of the photo. I'm going through the extras again, one by one, hoping to find it but, well, I'm impatient and decided to have a go at finding it tonight. Anyways, I'm rambling - and the last thing I'm sure you want is a rant from a stranger - and I just thought I might ask you; the photo is this one and I'd love to be able to get a bigger version from - I reiterate - capping it myself or if perhaps you'd have one. Again, I know this is odd and feel free to just ignore it if you want; I just figured there was no harm in asking. You are very kind, non_timebo_mala, but I am afraid yours in the best copy of this image I've yet seen. Yes, I just loved the work EW did as Frodo. I screencapped him a lot, yes! 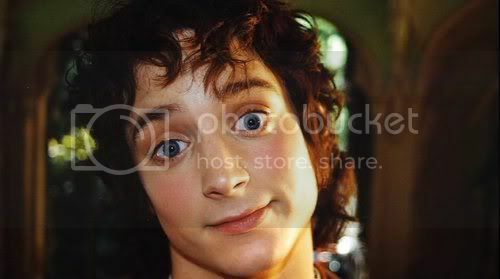 She is not only a staunch Frodo fan, but a fan of Elijah just as much. She's been doing an astonishing multi-chapter project in her LJ recounting the experience of the making of the LOTR films but all from the POV of Elijah Wood, called "The Journey of Frodo". To put it together she constantly watches behind the scenes footage, finds interviews, all kinds of photos that have floated around the internet. Although she's not a screencapper, she has obbserved the footage from which it comes lovingly, attentively and often. Why not send her an im, or just post in her LJ, asking her the same question. You can say I referred you to her. She's a regular reader of this LJ. But she would surely answer you anyway, and gladly. If she doesn't know where this shot comes from, I'm betting she would know who does. She has a wide Frodo-EW-fandom acquaintance.